Written for the new curriculum, these termly standardised assessments enable schools to accurately measure and predict pupil progress in maths and benchmark performance against other children of the same age at a national level. 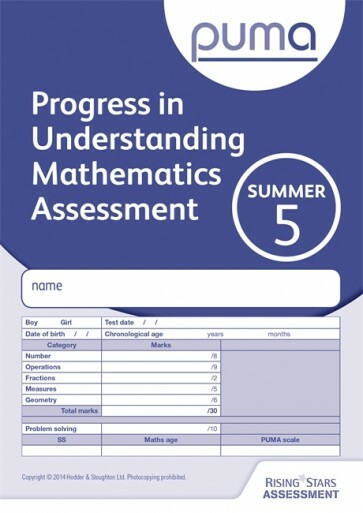 Progress in Understanding Mathematics Assessment (or PUMA) enables schools to reliably assess, track and predict pupil progress in maths across the primary years. These standardised termly tests are simple to administer and provide you with a reliable range of information that will support and guide the management of effective learning in the classroom. Uniquely, the series offers three tests for each primary school year, so that you can monitor progress term by term. PUMA was previously published by Hodder Education and is now part of the Rising Stars Assessment family.